Toch wel interessant: the 13th zodiac sign..
Ophiuchus, the Snake Charmer, is the thirteenth of the twelve constellations of the Zodiac. It is the forgotten constellation, perhaps, for the Sun actually spends more time before the stars of Ophiuchus (19 days) than it does in neighboring Scorpius (6 days). 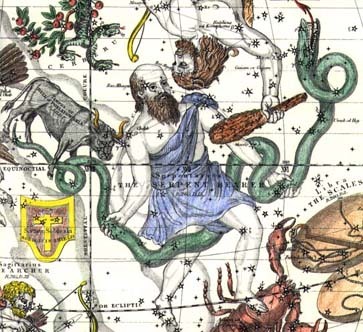 Ophiuchus is one of the 88 known constellations and was also one of the 48 listed by Ptolemy. It is a large constellation located around the celestial equator between Aquila, Serpens and Hercules, northwest of the center of the Milky Way. The southern part lies between Scorpius to the west and Sagittarius to the east. Of the 13 zodiacal constellations (constellations that contain the Sun during the course of the year), Ophiuchus is the only one not counted as an astrological sign.